An article in 'the Guardian' today exposes the truth about Labour peers supporting STPs and privatisation of the NHS. Norman Warner (Lord Warner) served as a Labour health minister from 2003-07 and now sits on the cross benches and Sir John Oldham is the adjunct professor for global health at Imperial College, and is the former chair of the Independent Commission on Whole Person Care. Labour advisor 'Simon Stevens' the current boss of NHS England devised the Five year forward view, a document all STPs are based on. As with John Oldham's global health operations, Stevens was ex vice president of U.S firm Unitedhealth's Global operations wishing to implement profit making American healthcare models across Europe. Stevens' Five year view is to implement insurance-based Accountable Care Organisations (ACOs) here in England. Labour peer' Lord Carter' also supports the STP models and recently visited Preston county hall in Lancashire meeting with health trusts and civic leaders debating his private care at home model. Today however, Warner and Oldham suggested something that would shock many traditional Labour supporters. They suggest the following principles should apply to sourcing new revenue for the NHS and care system. In an attempt to justify these disgraceful attacks on working people, Warner and Oldham in their Guardian news article proceed to scaremonger the public with stories about what 'might' happen if their draconian principles were not implemented. Ironically, the former Labour health minister Lord Warner, who has 'formed an unholy alliance with the rightwing thinktank Reform' ; supports upfront charges for the NHS. In the case of Reform, this would be a "suggested" £10 NHS "membership fee" per month. The article in today's Guardian is reminiscent of how many Labour MPs and Peers support and promote private companies or policies then leave to work for the private sector industry, i.e. the 'revolving door'. Warner is certainly in that category. New Labour's 'Tony Blair' appointed Carter as a Labour peer in 2004. 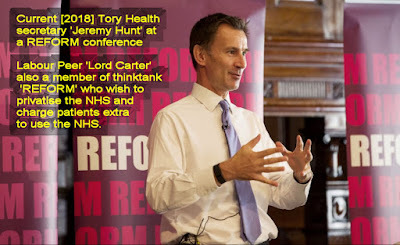 Lord Carter co-founded private nursing home company 'Westminster Health Care' in 1985 with Martin Bradford. He's been lobbying for the private care-home sector to take on more patients from over-stretched NHS hospitals ever since Simon Stevens revealed the STP plans for England. Carter was also previously president of Mckesson enterprise ltd international operations group (business portfolio holder), Mckesson specialise in orthopedic imaging/consultancy private sector work. In 1985, Lord Carter founded Westminster Health Care which he built into a leading health care provider and subsequently sold in 1999. Carter is now a private investor and director of public and private companies in the fields of insurance, healthcare and information technology. Previously many Labour politicians have made full use of the 'revolving door' between the private healthcare industry and government. 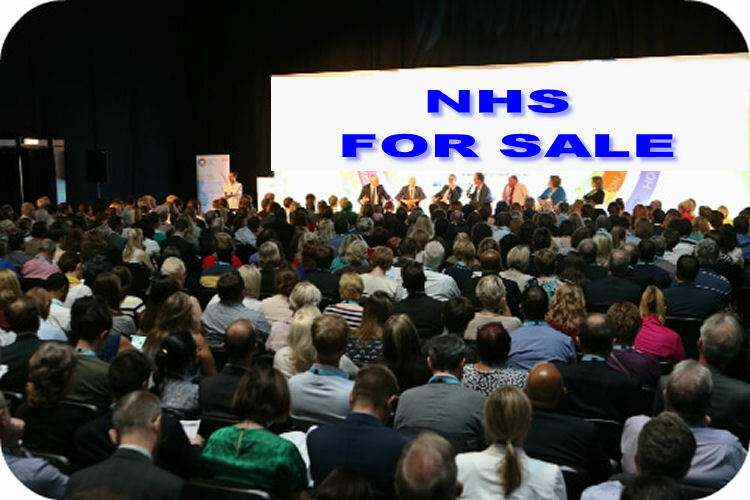 Alan Milburn and Patricia Hewitt are among the ten previous health ministers who have taken lucrative consultancies with private health care companies. If this is the view of Labour peers such as Lord Carter and Lord Warner (now a cross-bench peer), then what do Labour MPs think of all this support for changing the NHS into a private insurance-based American model? Who can we entrust to save our NHS, if not ourselves? Both Warner and Carter claim NHS hospitals are draining money from elderly care. A new report by former Health Minister, Lord Warner, recommends charging people to see their GP, charging people for overnight stays in hospital, or even charging everyone £10 a month for NHS services. New Labour's White Paper, was it the blueprint for the STPs five year forward view? 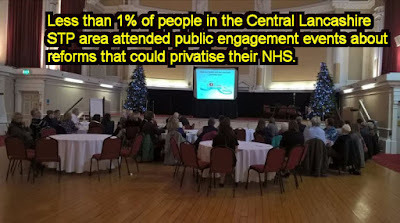 Health scrutiny councillors in Lancashire are being asked to approve STPS.. The Department of Health & NHS England have paused STPs for a twelve week public consultation as from last Friday 2nd March, yet today, Monday 5th March at county hall Health scrutiny councillors are being asked to approve them..
A letter to the Commons Health Select Committee in February from the health secretary Jeremy Hunt said the details of exactly how Accountable Care Organsations (ACOs) will work, including the contract terms involved, need to be made clear before more work is done . *Sustainability & Transformation Plans are eventually to become ACOs. Integrated Care Partnerships (ICPs) is the latest name for ACOs used confusingly in Monday's scrutiny agenda item 5. There are also currently two legal challenges to the validity of ACOs via judicial review. 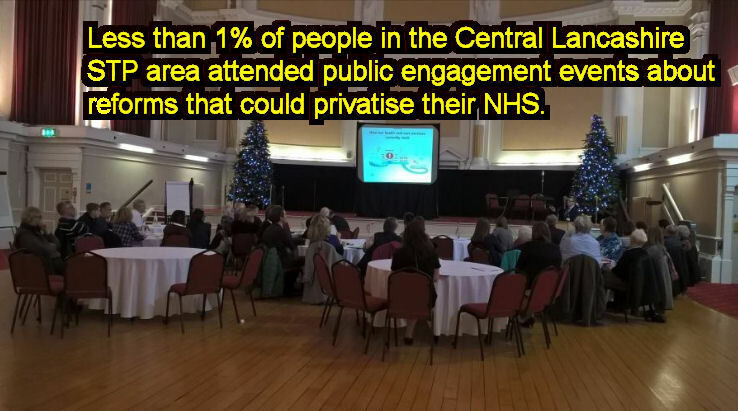 That hasn't however stopped those pursuing STPs at local level from trying to get agreement from other partners such as scrutiny councillors like yourselves. QUESTION 1: The public consultation about Accountable Care Organisations (ACO's) started at the parliamentary Health select committee only last Friday 2nd March and lasts twelve weeks, yet bullet points (a) and (d) on agenda item 5 is asking us to 'support' action that enables rollout of STPs across Lancashire & South Cumbria, including five ACOs (now called Integrated Care Partnerships or 'ICP' for short). Why are we today being asked to support and hence approve these ACOs/ICPs when public consultation on them has only just started? QUESTION 2: Agenda item 5: The item on STPs appears to have been included as bullet points under the banner of health inequalities and life expectancy. Whilst this area is generally supported, worryingly, bullet point (f) states that due to declining funds and resources "short term demand management initiatives are likely to be prioritised over strategies to address inequalities". What exactly does 'demand management' mean? Does this not indicate that 'demand management' - which many see as rationing of healthcare and medicines - will take precedence over strategies that deal with healthcare inequalities and how funds are distributed across communities classed as deprived areas? QUESTION 3: Do other members not agree, that if we as scrutiny councillors support Agenda item 5 we will be agreeing to something the public and MPs do not understand and have as yet not commented on. Yet bullet points (a) and (d)are asking us to make a judgement on these ACOs without knowing all the facts. Are we expected to do that whilst consultation has only just started? MOVE: Consultation about what Integrated Care Partnerships/STPs/ ACOs has only just started. To make a decision to support them as in Agenda item 5 at today's meeting would pre-empt the outcome of the ongoing consultation. I/we move that a decision on supporting agenda item 5 titled "Current Lancashire and South Cumbria (STP) Level activity" be deferred until NHS England and the department of health have completed their public consultation to enable us to make a better informed judgement on what exactly we are supporting. Agenda item 5 also finishes stating: "These actions will also address the priorities set by the Health and Wellbeing Board". What are these 'priorities' of the Health and Wellbeing Board? How do these 'priorities' affect the public? and are the Health & Wellbeing Board aware of the pause for consultation before going ahead with STPs/ACOs?